I just do not understand how two nurses in Houston managed to get infected in a high containment ward by this same disease I am seeing out here. After those infections, millions of Americans were convinced that this was a World War Z-like virus, in that if it could even come close to a human it would likely infect them. Here most of the time when a house gets an infected member, no one else gets infected. Last October, I gave notebooks to monitors in four villages that had not yet had any Ebola cases; one of them also monitored a dozen or so little collections of 20 houses around his area. Most of the time when there is a case in a village, it seems there is not even a second case. But of course, there were two villages with over a dozen cases each, so the story still favors a notion that Ebola spreads easily… but just not most of the time. Last November, my Ministry counterparts and I went out to try and assess if household quarantine promoted household transmission at a time where there were no referral beds and sick people stayed, and mostly died, in their homes. The important part of that study for this tale is that we found 18 households that had an index case in October and the case stayed in the household, but the household was not quarantined. This is not a sample! It was illegal for there to be a known case and the household and contacts not to be quarantined. We learned about these folks because they were in the database of cases but not in the quarantine list or the contact tracers in their areas had heard rumors of these households. I have no idea what processes of bias brought these cases to our attention. But, they are the best insight into “natural” household transmission at that moment given all the social dynamics in play. 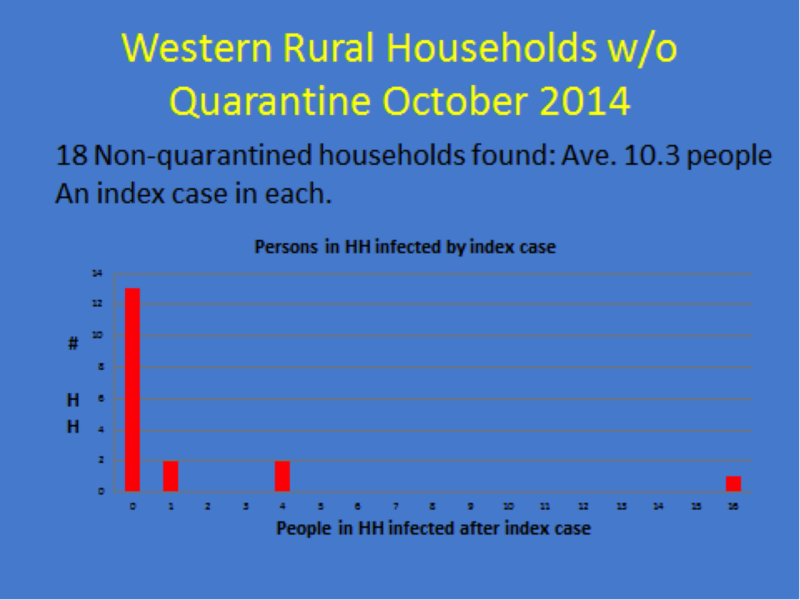 The figure above shows how many other people became infected in these Western Rural District households over a period of at least 3 weeks since the index case. Note that in 13 of the 18 households, no one else gets infected! But in one of the 18 households, 16 freakin’ people got infected and 14 of them died. Without that one house, this insight would suggest a disease with an R0 (an outdated and inappropriate concept for Ebola) less than one. These are crowded small households, mostly without running water! And these 18 households are typical of all the other insights that I have, like my four monitors with notebooks. How is it possible that, in Houston, two people got infected giving us one impression while some villages had a case and usually no more, giving the opposite impression? I think the answer is in part bias. I suspect every case investigation with a transmission chain record I see here is (when referring to the graphic above) one of the hyper-transmission events like the 16 infections household. In Kambia, where I am, in Freetown, where I was last week, most case investigations find no certain link to a past case. But, those do not make a big mental impression. When talking about the transmissions in 2015 in Freetown, people talk about the boats of sick sailors that came back and spread themselves around the neighborhood of Aberdeen causing dozens more cases… or the “herbalists” (traditional healers) who got together in a secret ceremony and cut open their dead colleague and then went and treated their patients causing dozens more cases. These are the freak, hyper-transmissible events. They are like the 16 infected member household above. They are probably unusual, and maybe even outliers, but they are what make this outbreak so tough to stomp out. Given that over a dozen more sick patients in the US have come for treatment without another infection and 30,000ish returnees have come back from the infected countries and only two (Craig Spencer and the Houston case) have gotten sick post return suggests the Houston hospital infections were unusual as well. There is a growing body of evidence that there have been many, maybe hundreds of Ebola cases in this region each year for decades. The question arises, why at this time did it conspire to run amuck and spread to cities? What are the outlier characteristics this time around? The rinsing of bodies at burials has been going on. The tradition of people having the herbalist cut open their loved one to look for curses inside has been going on. The herbalists’ secret autopsies of one another has been going on. But this year, this intermittently transmittable disease has been anything but. I got back here a few days ago after 3.5 months back home, and oh my gosh are things different! The posters and billboards from last September were all about, “Ebola is Real!” in an attempt to get people to believe that this outbreak was a “natural” disease and that the messages people were giving could save the lives of their families and them. By the time I left, most people believed that Ebola was real. Lots of huge social changes had happened, like people reducing their touching and kissing of bodies at funerals, and the messages popping up on posters were focused on key measures to prevent the disease: Know the Signs and Symptoms, Get treatment early, Call safe burial teams to bury a body… Now the new billboards are mostly about believing the government will function. The emergency Ebola call number is 117, so one popular poster says “117 Works!” meaning that after months of people calling that number with no one answering the phone or no meaningful response if they did pick up, now if you call 117 you will get help. Another one says, “Ambulances are clean and safe” to battle the perception that if you call for an ambulance and get in it you will probably die… which unfortunately is still true. My favorite one says something like, “Hospital beds are available” with a picture of a nice bed and a European looking doctor in PPE. As I talked about before in the Day 54 posting, this past fall the lack of Ebola treatment beds available made it so that nothing in the interlinked response system worked. People viscerally knew that; now there are plenty of beds and now most everything works as it should. The idea that the fundamental messages have shifted from battling disbelief in the reality of Ebola to battling distrust in the functioning of government and relief community seems to me a big victory. People in the wealthy countries often don’t trust their government’s ability to function in a disaster… so at times of crisis when there will always be some disbelief and discontent, this might be as good as our species gets. The fact that there are lots of beds, far fewer cases, and all the elements in the Ebola response (117 call-lines, ambulances that arrive, treatment and safe burial teams) have become sufficient has made for a radically different vibe! My peers have gone from a desperate state of 19 hours a day panic mode driven by fear and terror about where this outbreak is headed, to an upbeat “there are clear tasks that need to get done” mindset. Everyone now can see that what has been happening in terms of social dynamics and social messaging, and in terms of the services they have created, is making a difference. The fact that Liberia might be back to near baseline is very encouraging. Most importantly, the vibe among the Sierra Leoneans has changed in the same way. When I arrived, the receptionist at the hotel said “Welcome back. We are now winning!” The children on the streets who were friendly but physically distant before now run right up beside you and get physically close in their exuberance. They have some of the classes going again in school and kids are playing soccer together on the streets and in the fields which was not allowed before. The most humorous change for me are the gals on the street who rent their services. Before, they would sit in their chairs as men walked by and casually say, “Good evening.” Now, they get up and are much more aggressive in their friendliness clearly indicating that they are actively back in business. As a public health person, knowing that sperm can transmit the virus for over 90 days, I see this last social uptick as not completely positive. There are only about five well described sexually transmitted cases from survivors here, but as we get to the end game, these lower population attributable risk routes of transmission are likely to be either more detectable and perhaps more important; especially cases associated with people crossing the border from Guinea. Thus, I fear while the forest fire called “Ebola” looks a lot smaller and people are soooo ready to celebrate, we are likely some months away from declaring the country Ebola free. All those 2015 graduates hoping to work on Ebola might just get their chance. Darn!